Follow us on Twitter @KingBossMods for in-game update notifications. You can also follow development news at KBM's Facebook page. YouTube SL Tier 1 - 14 Boss playlist including all bosses from Endless Eclipse, Frozen Tempest and Triumph of the Dragon Queen all with vent overlay and KBM in action. (Recommended) Rift Scene's feature on KBM by Qube - Awesome Rift website. Italian review and walk-through by Jokerkira. Imperium of Zaviel YouTube Hammerknell 11 Boss playlist including Akylios & Jornaru, Murdantix, Matron Zamira, Grugonim, Rune King Molinar, Inquisitor Garau, Sicaron, Vladmal Prime, Estrode, Inwar Darktide and Soulrender Zilas all with vent overlay and KBM in action. No Remorse downing Ituziel with KBM tagging along. Perfect kill of the first boss in Infernal Dawn's fire wing. KBM YouTube playlist This is a selection of the latest YouTube videos which best show KBM in action. Contact me with recent videos if you're missed, it's not intentional. And lastly, a big thank you to all those who record their runs and upload them. I still smile to this day. Amenity downing Akylios with 18 men! and KBM tagging along. Awesome kill. Video example of Isskal Dance sync using v0.9.9. Freelancer downing Inwar Darktide in Hammerknell. Extract the Zip. Copy folder within the extracted zip to your addons folder. This Addon includes fully tested support for all Rift instanced raiding content, including full and partial support for: Grim Awakening, Endless Eclipse, Frozen Tempest, Triumph of the Dragon Queen, All base level 50 Raids and Slivers, and Expert and Master Dungeons. Various new and existing features are being included on a regular basis including; Mechanic Timers, Custom Mechanic Monitors (e.g. 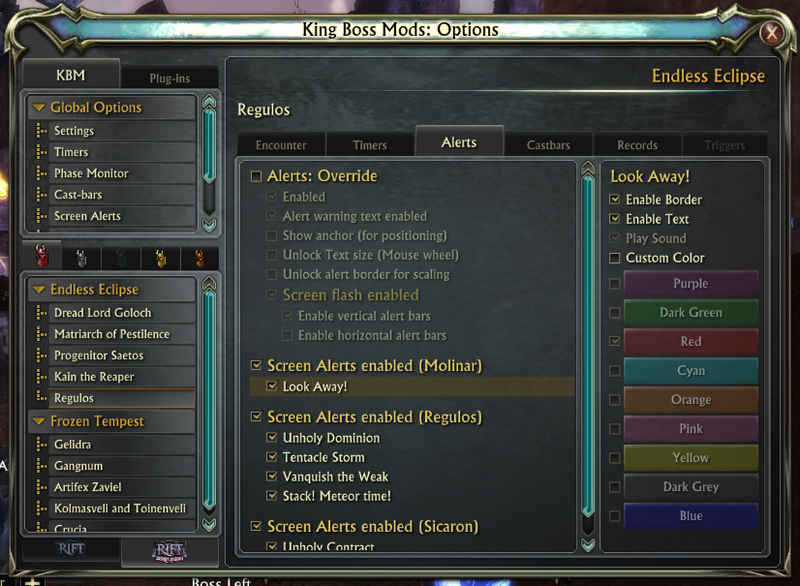 Rune King Molinar and Kolmasveli), Encounter Timers, Tank Swap monitors, Adjustable boss casting bars, Boss cast bar ability filtering, Enrage Timers and many more. Note: All Encounters have full to partial support for English, German, French and Russian translations unless explicitly stated. Automatically tracks all tanks simultaneously and displays debuff stack and duration information. Full tracking of tank stack and debuff duration by any raid member. Displays each tanks HP bar, updates real-time. Tracks and displays all tanks death states. Encounter timer display in MM:SS format. Ready Check support with overview. Rez Master, combat res monitor. Selection of optional mechanic or skill timers and screen alerts. Dynamic timers which can change duration during an encounter. Advanced dynamic linked interrupt engine. Links cast interrupts and alert triggers. Customize the size of all Timers, Alerts, Castbars and Phase Tracking. Customize individual colors of Timers, Alerts and Cast filters. English, German, Russian, Korean, Taiwanese, Chinese and French client support. /kbmoff Turns off the Addon's triggering methods. /kbmon Turns on the Addon's triggering methods. /kbmdefault List available keywords to reset specific items to default. /kbmoptions Toggle the GUI Options screen on/off). /kbmhelp Display these commands in-game). /kbmversion Displays the current version in chat. /kbmreset Try this before using /reloadui, or if the encounter has ended in success didn't announce a victory. /ReloadUI Use this in-case of any errors during the encounter. It'll reset it and the monitor "should" continue from where it left off. Arisae@Deepwood (my Wife) for putting up with me during the long hours I put in to this. Decayed@Deepwood (my Guild) also for their patience while I curse randomly when KBM crashes during testing. And all private benefactors for their on-going donations and support! The ready check monitor on .785 is sometimes missing stones/food/vials randomly for individuals. And not all of of them for 1 person either. Example, started trash in RoF tonight, put on pots/vials/stones it showed good. By the time we got to Ungolock, my oilstone was not showing on ready check, but i still had almost almost 5 hours left on the stone. This seems to relate to the new 65 stuff, the old stuff, seems ok, but i have not yet verified that to be completely true. I'll look in to that and try and get a fix out during this alpha phase. I hope so. It would technically error any time anything died during that encounter (NPC wise). It is doing it each time you need to jump to a new platform not just the last phase. The new version you have uploaded, does it fix this? Thanks Az, I think I see the problem. Looks like an issue when transitioning to the final phase. This version is giving an error and opening the error window on the Abominus fight. It does it every time you have to jump to a new platform. Why I always get this error when rift starting?